Harajuku girl wearing all pink street style with manga print leggings and super tall pink platform boots. Japanese artist Bisuko Ezaki showcasing a pink-and-purple street style while out and about in Harajuku. Japanese idol Cinnamon on the street in Harajuku at night wearing all white fashion along with a large manga artwork signboard. Silver hair and subculture inspired fashion on the street in Harajuku with items from AnkoROCK, Madoka Magica, Moussy, and Monomania. Harajuku girl wearing a hoodie with pleated skirt, white fishnet stockings, plush platform shoes, and a Japanese school backpack. Harajuku pastel fashion with ombre hair, Japanese art print shirt, plaid shorts and platform gold creepers. 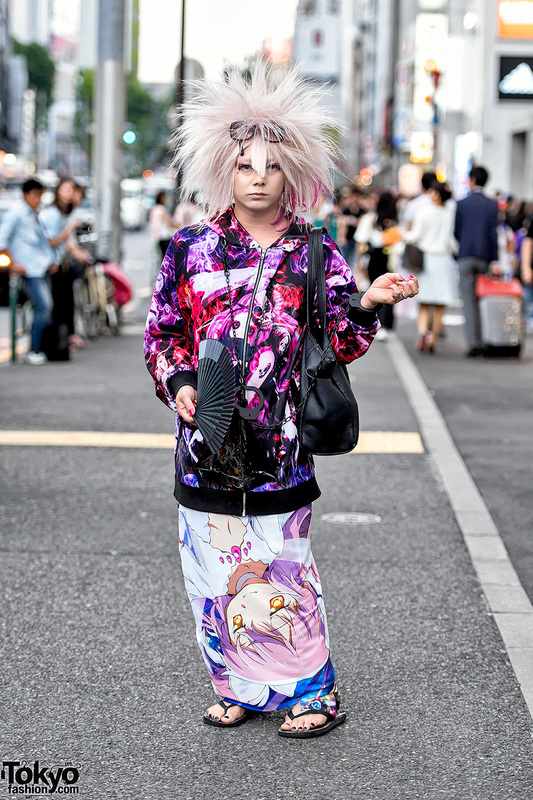 Harajuku guy with colorful hair and makeup wearing kawaii 6%DOKIDOKI fashion with a Hello Kitty shirt. Harajuku girl with kimono jacket, t-shirt, pleated skirt, sneakers and faceted backpack vs. Harajuku girl in cardigan, long t-shirt, thigh-high socks and creepers.